Gardening and digging in the dirt is one of the most enjoyable activities I’ve ever known. Simply add the herbs to an oven proof bowl and cover with the oil. Place in a 200° degree oven for about 2 hours, allowing the herbs to infuse the oil. Strain the herbs and throw away. (since they are covered with oil, many choose not to compost them). Add the beeswax to the infused oil and place back in the oven to allow the wax to melt. Stir gently once melted, and add 10-15 drops of various essential oils as it is cooling, if desired. Store in a cool, dry place in a covered container. I like to add 10 drops helichrysum for it’s skin renewing properties, or 10 drops lavender and 5 drops peppermint for their cooling properties, or 10 drops sweet orange and 5 drops rosemary for their energizing properties. Play around with scents you like best. To use, simply scoop out a quarter sized amount and rub into dry hands or all over your body if desired. Use after every garden session to keep hands soft and smooth. 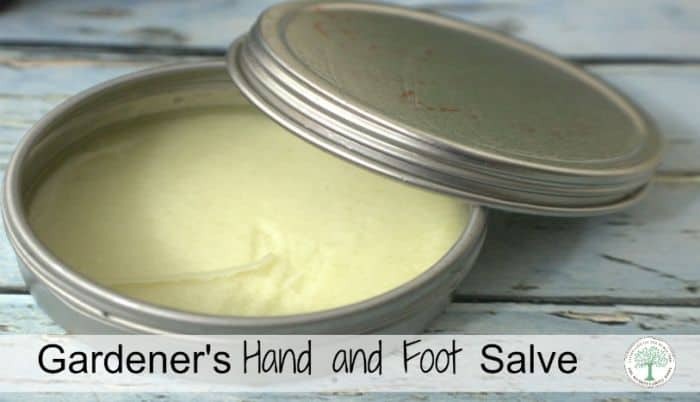 The shelf life of this salve is approximately 6 months, but can be cut down if you use wet hands to scoop the lotion out. Use only dry hands to apply the lotion over your hands and arms. Do you struggle with rough, dry, gardening hands? What do you use to soften them up? Be sure to pin this for later! Ha! I thought the title was “Garden Slave” which really got my attention – yes that’s me. Then I read it correctly which is good too? Hello Heather, at the time of gardening, my hands and feet becomes so dry and rough. I will definitely use your product for skin protection. I hope it will make hands and feet soft. Thanks for your blog. I am glad to hear you like it!